It is generally accepted that forestry and the market for trees in the future will develop as the environmental credentials for timber become more widely appreciated. Biomass and the unprecedented demand for, not just logs, but all parts of the tree is certain to underwrite future returns from forestry. Investment in forests – be it by Forest Products organisation, private owners, Pension funds or Insurance portfolios are generally for the ‘long term’. Current expectations are for a significant return in the future when the growing markets become realised. With this being the investment model, no forest owner is tempted to ‘cash in’ on their crop if the log market is ‘depressed’. A tree will grow by 4% per annum if it is just left untouched. Subsequently, log levels have had to be significantly above the current level of demand to, in effect, pre pay the log accrual, to, literally, tease them ‘out of the ground’! In previous years, there was an active trade in the export of Russian logs to other Baltic and Nordic countries. However, taxes and export duties have now stymied this option. Pulp, Paper and Timber mills cannot run without logs. Forest owners know this! With high log prices and poor demand and low prices for sawn timber – is the proverbial ‘rock and a hard place’ scenario for sawmills – losses for some mills have been colossal. Levels for some of the most significant groups range from £5 to £33 for every single cubic meter sold! The scale of total productions for the largest loss making group is 1.4m m3! In years gone by, the sawmilling sector of a large Forest products organisation (Assi, Stora, SCA, Enso-Gutzeit) that governed the market, may have represented around 5% of the total revenue. The balance being generated from pulp, paper and board products. Heavy losses were tolerated as it was an efficient use of the raw material. This is no longer the case. Some pulp and paper mills are mothballed due to the equally poor state of these markets! Some smaller mills have reduced their production as a method of reducing losses. Controlling the extent of losses, is hoped, allows reserves to sustain a lifeline until the market improves ! This, however, has not come in time for at least a dozen mills over the past year or so…. The recent weakening over the pound against the Swedish Krona and Euro show an additional ‘cost’ to the process of importing timber. Various well documented factors to do with the ’credit rating’ of the UK and our general economy are responsible for the fall. In May last year £1 = SEK11.46, two weeks ago that bottomed at £1- SEK9.45, with a small recovery to SEK 9.85. Putting that in perspective, for a price of, say £200 in May would now need to be £233 to give the sawmill the same in Krona terms! Until now, the mills have had to suffer and absorb this cost and allow it to further compound their losses. Finally, for the mills, there is a large glow on the horizon! The timber market is now a truly global phenomenon! Two markets that have ‘kick started’ a recovery highlight this fact. 1) USA. The US housing market, having been depressed for a few years has recovered to the extent that in recent months, the number of ‘permits’ to build has increased in the region of 30 % compared to the same month in the previous year ! Timber is a much larger component in US house building than it is in the UK. Traditionally, supply was from indigenous and Canadian mills, but, over the years, several mills, particularly in Canada have closed down. Just after the New Year, the $/Euro exchange rate relative to US lumber prices suddenly brought Nordic and Germanic whitewood into the US market – at a respectable level for the producers! One Swedish company, on its own now sends 10,000 m3 on a monthly vessel! 2) China. Much of the supply of Russian timber into the UK has faded as the Russians have struggled to conjure up the cash for logs and favoured an ‘easterly’ view! ie. supplying China. But lately, it appears that the Russians have not been able to meet the growing demand and new found taste for softwoods. Further, Canada had also played a part in Chinese supply, but are now more easily satisfied selling ‘over the border’ to the US! It is also worth noting that the British producers are also riding the World Market wave. One of our largest - with mills in the Welsh borders, Cumbria and Scotland have exported 35,000m3 – 675 containers overseas, including a large consignment to Alexandria, Egypt. While some individual exporters may bury their heads in their hands and pretend this is not happening, the medium and long term future for a robust and secure supply chain can only continue by accepting that, in all probability cost of packing case timber will increase by around 10% over the coming weeks. This may only be a temporary step in the overall trend ! From 3rd March 2013, a new regulation commonly known as the “EU Timber Regulation; EUTR” came into effect. It is a European Regulation designed to prevent the placing on the EU market of illegally harvested timber and any products derived from such timber. The Obligations laid out in the Regulation are predominantly aimed at those companies that do first place timber on the EU market, known as “Operators”. Operators are required to undertake due diligence for all relevant timber and timber based products, prior to their purchase. (b) where applicable, who the timber or timber products have been sold to. 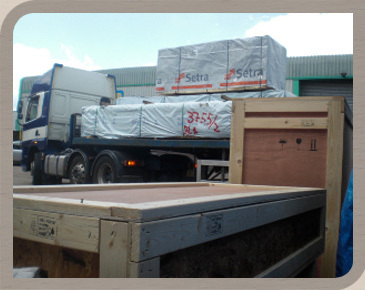 All of SFP’s timber sourced is from within Europe, and therefore we are a Trader in all of our transactions. However we go beyond the EUTR by complying with the Timber Trade Federation’s (TTF) Code of Conduct which states that all members must have in place an appropriate due diligence system. We comply with this Code of Conduct by submitting an annual summary report of our Due Diligence to the TTF, using the RPP (Responsible Purchasing Policy), a Due Diligence System that the TTF has created to support members. The summary report is checked to ensure we have undertaken an appropriate level of robust DD in our business. Thermowood .... now in stock !